A new group in Gaza calling itself the Sheikh Omar Hadid Brigade claimed credit for rocket attacks on Ashdod in late May. Omar Hadid was a key figure in the early years of Iraq's insurgency, aligned with al-Qa'ida in Iraq leader Abu Mus'ab al-Zarqawi. Indeed, his name was already being used in Islamic State of Iraq material in 2006. 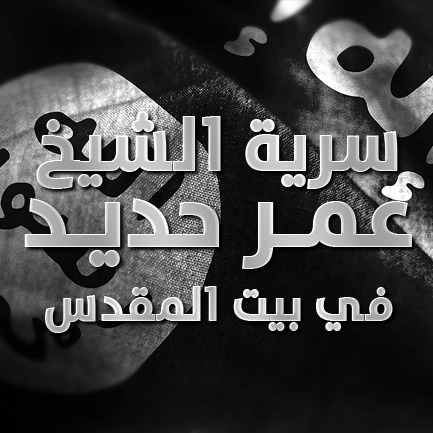 The use of this name, along with the fact that the brigade's video release uses two Islamic State nasheeds ("I am not content with a life of humiliation" and "We have the swords"), should indicate the orientation of this new Gaza-based group towards the Islamic State, similar to other small pro-Islamic State outfits in the area like Jamaat Ansar al-Dawla al-Islamiya fi Bayt al-Maqdis. The statement follows typical Salafi jihadi narrative in accusing Hamas of collaborating with Israel, waging war on Salafi jihadis, torturing Salafi jihadi detainees, stealing their weapons etc.. The statement emphasizes that these Salafi jihadis have refused to be drawn into an internal confrontation that Hamas is supposedly trying to provoke. The ultimate point is that this Sheikh Omar Hadid Brigade has chosen to direct its weapons at the Jews instead. The statement concludes with demands for Hamas to (i) release Salafi jihadi prisoners, (ii) stop engaging in media incitement etc. to provoke internecine warfare and (iii) to restore the mujahideen's weapons and rights. It should be noted that this statement comes in the context of some more recent wider agitation from pro-Islamic State jihadis in Gaza, some of which, contrary to what the Sheikh Omar Hadid Brigade makes out, appears to be targeting Hamas. For instance, Jamaat Ansar al-Dawla al-Islamiya fi Bayt al-Maqdis recently claimed an IED assassination of a member of the security forces of the "apostasy government" (i.e. Hamas) in Gaza for engaging in the "declared war on the monotheists." Nonetheless, the same problem endures for these pro-Islamic State groups that they are too small and divided to be accepted as official Islamic State affiliates, even as some of them have helped smuggle Gazan fighters to the Islamic State inside Iraq and Syria.